I love steel cut oatmeal, but I must confess that I typically consume oatmeal of the Maple and Brown Sugar packet variety. These tend to be a quick on the go breakfast that I can make and eat right at my desk. However, on the weekends I love whipping up a batch of delicious, nutty steel cut oatmeal. Making your own steel cut oatmeal allows you to customize your flavor combinations, which are endless, and control the amount of sugar you use. Last Sunday, I made a delicious batch of Apple Cinnamon Steel Cut Oats with pure maple syrup. These oats really hit the spot on a crisp, fall morning. I served up the Apple Cinnamon Steel Cut Oatmeal in hollowed out apples, although this step is definitely not necessary, it certainly is fun, adorable and the perfect use for the abundance of fresh picked apples I have on hand. I adorned mine with a few chopped walnuts and a drizzle of pure maple syrup. This recipe makes about four servings, which is great because I was able to store the rest in portioned containers and eat them for breakfast for the following two days. Now I’m going to keep it real here for a second. I loved these, the texture and flavor was perfect for me, but Brian hated them. I think he was expecting the texture and flavor of his packaged variety and these are pretty much the complete opposite. Take his review with a grain of salt because he’s not so much a fan of healthy eats. I thought they were fab and I hope you do to! Have a great weekend! 1. Heat butter in a medium sauce pan over medium heat until melted. Add in the steel cut oats and toast until fragrant, about 2 minutes. 2. Stir in cinnamon, nutmeg, cardamom and salt. 3. Add hot water, stir and bring to a boil. Cover and turn heat down to low; allow the oats to cook for 20 minutes. 4. Remove lid and stir in chopped apples and maple syrup. Continue cooking, uncovered for 10 minutes, or until oats reach your desired texture. 5. Serve in a bowl or hollowed out apple and garnish with walnuts, fresh chopped apples and a drizzle of maple syrup. Those apple bowls are the CUTEST and make me think of all sorts of fun ideas — I wonder about making an apple cake-like thing where a mixture is baked inside an apple, that would get all cushy and runny. Hm! Thanks for the inspiration… all of my brain gears are a-churnin’! I love steel cut oats myself. There are about a million combinations to be had out there. I like to cook them in liquid that is 2 thirds milk. I find that the oats get creamy that way. Finally, a banana goes a long way, as well as a couple of spoons of peanut butter. My wife is the same, she can’t stand the stuff. Mind you, that probably stems from her buffet server days where she was forced to look at congealed, crappy quick cooked oats. I love the idea of banana-peanut butter oatmeal! In fact, that may be tomorrow’s breakfast. Okay, you have me longing for fall in all sorts of ways. I love this idea! I don’t know if I’ve ever made my own oatmeal!? The presentation of your breakfast is absolutely beautiful.. I’d almost be afraid to eat it!! The oatmeal I’m eating now looks so boring now. Next weekend I’m making this! i looove the way u use the apple as a bowl. so cute! Such a great idea! I was going to make some sort of apple flavored oatmeal soon, but I love the presentation of this being served in the apples. Very cute! Great presentation! My husband eats oatmeal from scratch every morning with cinnamon and walnuts. I am sure he would love yours, too. Nice recipe! Just made it! So tasty! Thank you! Before I cooked my oat meal with milk and water, but this is so delicious! I love steel cut oats. That looks so beautiful sitting in the apple! This looks beautiful Jamie and so how I love oatmeal. I don’t typically add fruit…now thinking apple is a must try. I love your oatmeal in an apple! I would also love a crisp fall morning, but I haven’t had one yet here. Steel cut oats are my favorite- the instant ones just don’t have enough texture for me. These sound wonderful! How beautiful! This would be perfect to serve for a fancy brunch. I’m a huge fan of oatmeal too–especially on chilly days. The presentation of these babies is so cute! How could anyone not fall in love with them! I’m a steel cut oat girl myself. I try to avoid the packaged mixes (more for expense purposes than anything else) but I love adding flavors to my oats. Apple cinnamon maple sounds divine! I’m loving all the fall recipes! I can’t wait to make all of these. I made banana walnut and cinnamon oatmeal a lot this past winter. Can’t get enough. That’s the prettiest breakfast I’ve ever seen. I want some! 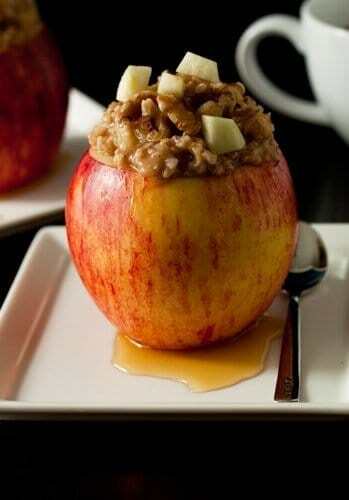 What beautiful presentation for the oatmeal inside the apple! I have never tried steel cut oats, where can you find them? I do love oatmeal so I’m sure I would like this type as well! Your recipe sounds yummy! You can get Steel Cut Oats at almost any store. Quaker makes them now, also look for Bob’s Red Mill. Hmmm. I think I may have said genius on your last post. So, this time I’m going to say – fabulous! Perfect fall breakfast. And beautiful. This is such a beautiful presentation! Love it! I haven’t tried steel cut oats yet. What is the difference between them and regular oats? This looks sooooo good! I make steel cut oats all the time, and am excited to try this variety! i would certainly like your recipe for the oatmeal but i dont think they grow an apple as big as a bowl do you realize that as long as it takes to cook the darn stuff that all you could possibly put in an apple would be at bast 4or 5 tblsp. lots of good full tummies onthat one . Actually Honey Crisp Apples are quite large (I noted this apple in the directions), once hallowed, I was able to place an entire serving into the apple. This was certainly more than 4-5 tablespoons of oatmeal. Thanks for stopping by. This is such a good idea. I love it. I would definitely NOT skip the hollowed apple out. YUMM! I love that presentation! Gorgeous! This one looks so pretty!!! An apple a day keeps the doctor away! How beautiful! Oh my goodness, I’m in love with the way you served this in an apple! Looks delicious! I’m going apple-picking this weekend & cannot wait to make this! WOW – this looks incredible. And the presentation is killer Jaime. LOVE the presentation! Steel cut oats are one of my favorite breakfasts. So good and good for you too! Oatmeal–and Red River Cereal–is a staple for me once the weather gets colder, but I too tend to be lazy and make the instant packs. However, this recipe certainly looks like it’s worth the extra time. Thanks! And I love how you put the oatmeal inside of the apple, how creative! We love steel cut oats too and I love finding a recipe for them, we will try this tomorrow AM, thanks! I love this! Steel cut oats are one of my favorite breakfast meals. Loving the presentation-cute and clever! I make my SC oatmeal by soaking it overnight in my rice cooker and then turning the rice cooker on for 15 mins in the morning. I LOVE it -I eat it every morning for breakfast because it is sooo easy. Now I see yours is much more decadent – I may try to combine yours and mine -maybe toast first add the water, soak over night and the chopped apple in the morning. Yumm!! My personal fav oatmeal is orange-cranberry with walnuts though. I use low-sugar orange marmalade for the orange flavor. I made this this morning for breakfast! Sooooo delicious! Thanks for the recipe! I have a similar recipe to this and i substitute 1 cup of water with 1 cup apple cider!!!! You should try it! thanks for this recipe. My husband takes this to work and loves it!! I am so glad the recipe is working for you and that your husband is enjoying it.